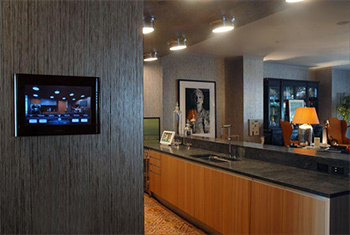 A modern home automation system is an up-to-date completely integrated system that can operate and manage all electrical equipment in the home for the purpose of increasing comfort, flexibility, communication, rational energy consumption, and (above all in this day of uncertainty) safety and security. In short, an integrated home automation system is a modern wonder. Fully customizable, it can meet any need or want that you may have. When your home has an integrated home automation system it means that all of your everyday building functions are controlled with just a push of a button. Why Have an Integrated Home Automation System? Many of the various settings for systems like light, heat and air, and security that you rely upon day by day can even be programmed to automatically carry out their functions in unison at preset times. For instance, a fully integrated home automation system can not only preset temperatures, close and open blinds and curtains, dim lighting and lock and unlock doors, but you can also add an occupancy/vacancy sensor. With an occupancy/vacancy sensor, you, the owner can be assured that when you are away from home it will be just as secure as when you are in residency. When you are at home, it is cost-effective in saving money in that it will automatically turn your lights on and off as needed. If you have children, an occupancy/vacancy sensor can be invaluable. !You will never have to wonder if your children remembered to turn off the lights when leaving a room! This system is also very useful in areas of the home that are not used on a daily basis, such as utility rooms and basements. When entering an especially dark area, you will never have to worry about stumbling around in the dark until you reach a light switch. The sensor will automatically light the area for you.